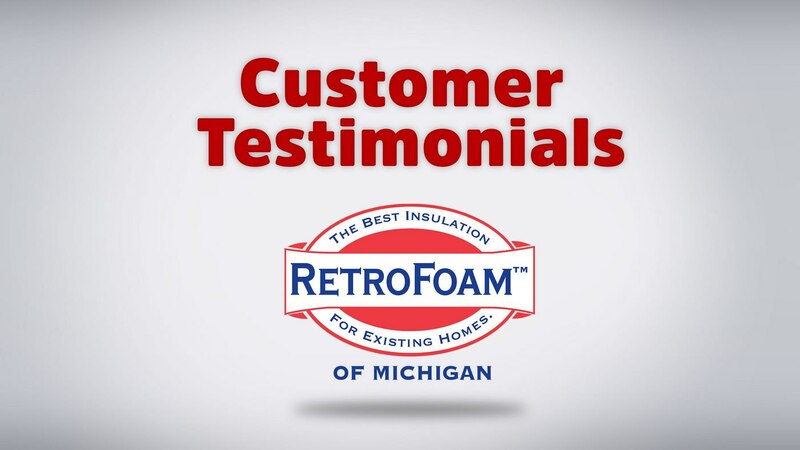 Below are a variety of reviews, comments and testimonials from customers who have had their homes insulated by RetroFoam of Michigan. "While residing and replacing windows found out our house was missing insulation. House built in 1940 and added onto couple times over the years. Our Contractor recommended RetroFoam. We checked them out on the net and watched the videos. Started calling other Insulation Contractors in the area and none called us back. Due to the siding install we needed someone quick. Called RetroFoam and rep came next day to give quote. Not cheap but home improvements are inherently gonna cost. The crew showed up 2 weeks later early. Good crew, worked very well together. Each member had their responsibility and by 2pm were complete. We had one repair around unsupported drywall by the new window. RetroFoam pulled the drywall back in and no issues. Very professional group. I can't believe how instantly the house was more quiet. We had night temps in the high teens last two nights. The furnace doesn't come on as much. House is warmer and cold spots are gone. Money well spent. Will continue to be more value as heating bills are reduced." "Had it done on our entire 1500 square foot home in 2009. It was an instant difference with heat retention in the house. I work in a field where we use thermal imaging so I had taken thermal pictures of the house before and after and all the cold spots were gone. Wonderful company to work with and the investment paid itself off in less than 5 years with the savings we experienced. I was sad to sell that house, the new owners however were happy that retrofoams warranty transfers. If I ever feel the need to re-insulate our current home I know who I will be calling!" "I had RetroFoam come out to do the walls and crawl space. There were to separate groups. They were very friendly and professional. It was very hard to do the crawl space because it is not very deep and hard to do anything. They did it with no complaints and they found that a couple of my heat vents had come undone. They fixed them too at no extra cost. Love this company and personal. Would highly recommend them to anyone and feel great to help them to get the great service I got." "I am thrilled with the result after having Retrofoam insulate my basement rim joist, exterior walls and attic. They did a great job, both crews. They were efficient and didn't waste time. Since having the work done at the end of September, I have noticed a huge change in the temperature in the basement, especially. Before having the rim joist done, it was cold and required a sweatshirt or jacket to be comfortable. Now I can spend hours down there working on projects with just short sleeves and not be the least bit uncomfortable. My only regret is not having this done years ago. I appreciate too, that the company honored a 5 year old quote that I held onto from a previous estimate that was given to me. They were able to save me $600.00 in rebates from Consumers Powers, too, which they applied to my loan. I highly recommend to anyone considering having this done, to go for it. It is worth every penny. Thank you Retrofoam of Michigan for a job well done." Read more reviews on Facebook and Google.